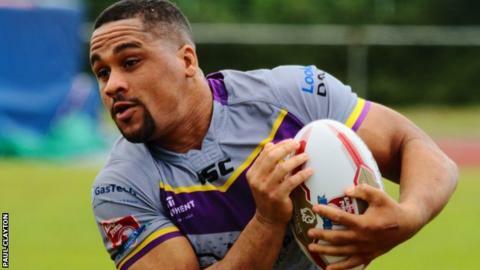 Newcastle Thunder centre Derrell Olpherts has the ability and potential to be a success in Super League after agreeing to move to Salford next season, says head coach Jason Payne. The Red Devils confirmed that Olpherts, 25, would move to the AJ Bell Stadium in 2018 having impressed at Thunder. Olpherts has scored 14 tries in 15 games this term. Payne told BBC Radio Manchester: "He's developed into a talented player and it's nice Salford have taken a chance." He added: "He's got all those aspects to his game, he's ambitious and has everything required of him to make him a longstanding Super League player." The former Hemel Stags outside-back joined Thunder in 2016 and scored 13 tries in 16 games during his first season. "He's a big guy for an outside-back, 6ft 2in, almost 100kg, he's quick, agile and has a great fend and works really hard on his game," Payne added. "When you've got that collection of qualities, you're going to be pretty good at playing the game. I've no doubt Derrell will repay Salford's faith 10 times over."